The updated licensing and violation information will help guide parents, replacing a deficient database revealed in Portland Press Herald reports. 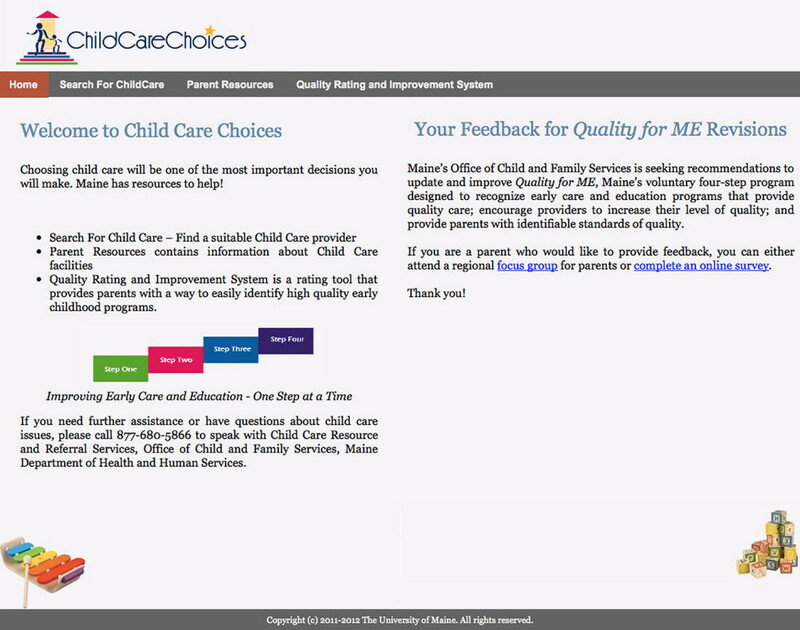 For the first time, Maine parents who are deciding on day care providers for their children – or parents who want to know whether their providers have licensing violations – can look at state inspection reports online. The state Department of Health and Human Services on Monday unveiled an updated database of the state’s child care providers, correcting deficiencies in a previous version. That version did not display the inspection reports and contained outdated information, including high rankings for at least one day care center where children were abused. The state's new database gives Maine parents more information about licensing and enforcement actions and reports of corrective actions against child care providers. The change comes after a series of stories in the Portland Press Herald/Maine Sunday Telegram last winter revealed that the state’s day care database provided inadequate and outdated information on quality rankings and licensing information. In January 2014, Sunshine Child Care & Preschool in Lyman still received the second-highest ranking in the database, four months after it had been sanctioned by the state and given a conditional license for a host of violations detailed in a nine-page report filed by DHHS inspectors. Sunshine closed that January shortly after its problems with state inspectors appeared in media reports. DHHS officials say the new database – at www.childcarechoices.me – was under development for months and cost the state $23,000. It gives Maine parents more information about licensing and enforcement actions and about reports of corrective actions the state may have taken against a provider, they said. The website was working Monday, and a random search of several day cares showed their licensing information. If the day care received a poor grade from state inspectors, the full report was online. DHHS Commissioner Mary Mayhew said Monday that the revamped website is part of the state’s effort to reform its day care inspection program. “It’s another example of our commitment to transparency, and to provide meaningful information to parents as they make decisions about their children,” Mayhew said. The Press Herald/Telegram’s stories revealed that Maine was one of 18 states that did not share inspection reports online, making it more difficult for parents to learn about violations found in inspections. Created in conjunction with the Maine Office of Information Technology, the database rates all of the nearly 2,000 day care and child care providers active in the state, including 741 in-home providers, and will be updated frequently, said DHHS spokesman David Sorensen. Currently, 26 states post inspection and complaint reports for child care centers, and 23 states post that information for in-home child care providers, according to Child Care Aware of America, a Washington, D.C.-based advocacy group. Reports of abuse at the Sunshine Child Care & Preschool last January sparked criticism of the state’s response to reports of problems in child care centers. After weeks of scrutiny, the department made changes, including increasing the number of investigators. The Division of Licensing and Regulatory Services, a branch of DHHS that oversees child care licensing, has increased its licensing staff from 13 caseworkers to 25 in the past year, reducing caseloads from 162 per caseworker to 80, Sorensen said. Before the reforms, Maine had one of the worst ratios of inspectors to child care centers in the country, according to Child Care Aware of America. Former DHHS workers told the Press Herald/Telegram that those workloads left inspectors without enough time to conduct thorough inspections. Child Care Aware of America ranked Maine 47th for its oversight of child care programs, in part because of its lack of online transparency. The state also was the sixth-worst for the number of inspectors relative to the number of child care centers, with only one inspector for every 179 centers, according to the group. Child Care Aware recommends that states conduct four inspections per year for each facility and employ a ratio of one inspector for every 50 centers. In Maine, the centers are inspected annually, and inspectors also respond to complaints. “If there were information posted about previous incidents (at Sunshine), I probably would have taken my son out earlier and would have been able to avoid him getting hurt altogether,” she said. Maine DHHS took no action in the Lyman case for more than a year, even after investigators determined that abuse had occurred. The state website contained no information about the allegations and continued to show a high rating for Sunshine Child Care even after the abuse allegations were substantiated. In August 2013, the state granted the business a conditional license, allowing it to operate on the equivalent of probation. The center closed on its own in January 2014 after the allegations surfaced in the media and parents began pulling their children from the program. Three families of children who attended the day care center later filed lawsuits accusing Sunshine owners Cheryl and Daniel Dubois of assault and battery, negligence and intentionally causing emotional distress for children. Daniel Dubois has denied the charges. Sen. Eric Brakey, R-Auburn, a chairman of the Legislature’s Health and Human Services Committee, supports the changes to the website. “It’s a positive step toward more government transparency and will allow parents to make better decisions about child care,” he said.